A leftover party wine (they always find their way to the blog, don’t they?) and I know it’s only Monday night but it’s been a pretty mixed and chaotic day and I’m feeling somewhat tetchy, so hey, what are you, my mother? Youthfully vibrant purpling colour. A dusty nose of violets and rose petal, satsuma plum and prune juice, finishes with a savoury, meaty aroma. There’s a subtle dose of VA which I like to think is deliberate to lift the nose and add some zip and zap. The oak is simple and pencilly, leading to varnishy – not especially stylish, but well-handled for this style of wine and it’s price-point. In fact it’s very appropriate. The palate is purpley – if you could taste colours then a youthful, vibrant, fresh and zingy red wine would be purple. There’s a floral flavour, some meatiness again, and the flavour spectrum runs from red to blackcurrants. It’s supple and soft – although tannins are certainly noticeable. There’s no lean-ness or green-ness – it’s basically a mid-weight wine that is pleasantly supple and textural and flavoursome without the ballsiness, intensity and drive you would get at another level up. Yeah, it’s not a bad drop for a Monday night home-cooked dinner. It’s difficult to discern individual varieties here and given the wine is labelled Western Australia I wouldn’t expect to pick the cabernet from the shiraz from the merlot. It’s a simple dry red style with characteristics of each variety, but melded sufficiently to make identification tough. But of course it don’t matter none for this style and price. Drink now or short term. Value: I reckon I've seen this label from $20 down to $12 or 13 on promo. Good value in the middle of that range, great value on promo. 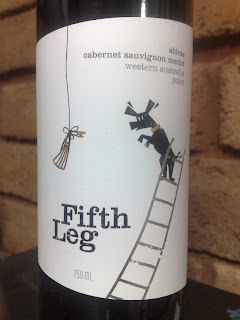 Producer: Fosters Group, out of the Devils Lair stable – www.fifthleg.com.au – a big company wine really. Region: Western Australia – the previous vintage Fifth Leg Red came from both Margaret River and Geographe, but the website is not up to date so I can’t tell you where this one is from. Vintage: Generally a good one in West Australia – mild and consistent growing season, a warm vintage without extreme heat spikes or undesirable rainstorms.